The Adopted and Adored issue promotes the work of the RSPCA and other organisations that re-home abandoned dogs. 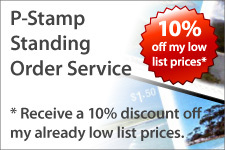 Coincidentally, both Royal Mail and the United States Postal Service have issued stamps on a similar theme this year! 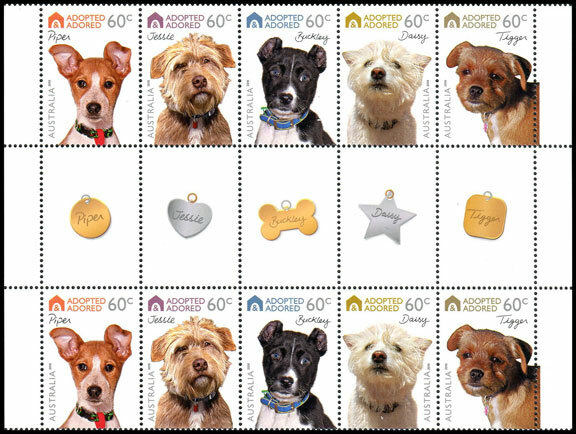 The Royal Mail issue celebrates the 150th anniversary of Battersea Dogs and Cats Home, while the US issue promotes the adoption of shelter pets. 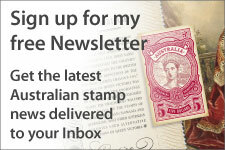 Issued a day after the 28 June rate rise, this issue will be the first commemorative issue to include 60c stamps. The initial 55c stamps show a booklet and coil, with the July-August Stamp Bulletin noting that the coil stamps will be printed by both McKellar Renown and Pemara. The 60c stamps were issued in horizontal strips of five. The gutter strip features dog tags with the names of the five adopted dogs. The contract for the self-adhesive stamps was split between Pemara and McKellar Renown. The work of the two printers can be easily distinguished. The best way to distinguish the work of the two printers is by the colour of the '60c' - dark grey on the McKellar Renown stamps and light grey on the Pemara stamps. 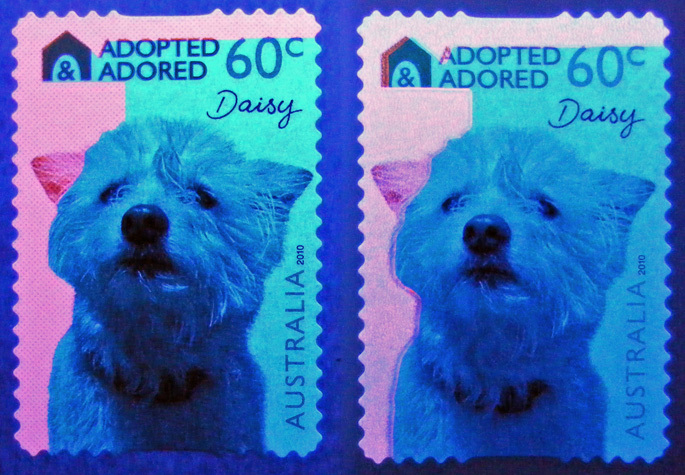 The colour of the dog's fur also differs between the printers � in particular Buckley is a black dog on the McKellar Renown stamps, while Pemara's stamps have him as a blue-black dog. The die-cutting of the McKellar Renown stamps also appears to be a little inconsistent. The first strip of five I examined had Tigger's and Jessie's ears touching the edge of the stamp, while other parts of the coil (and the booklet stamps) have their ears well clear of the die-cutting. The five designs were issued in a self-adhesive booklet of 10. The arrangement of the stamps means that collectors who want a set of five from the booklet will need to settle for a block of four and a single stamp. 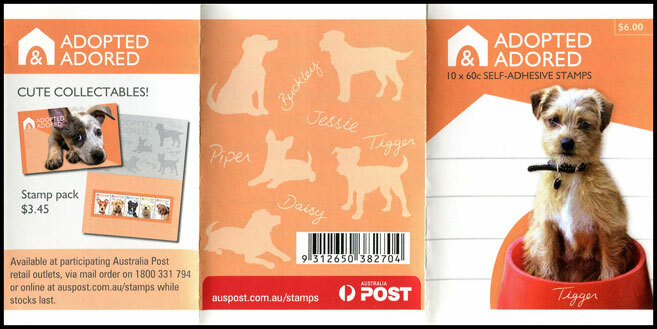 The booklet stamps are the same as the coil stamps, and only differ based on the backing paper. 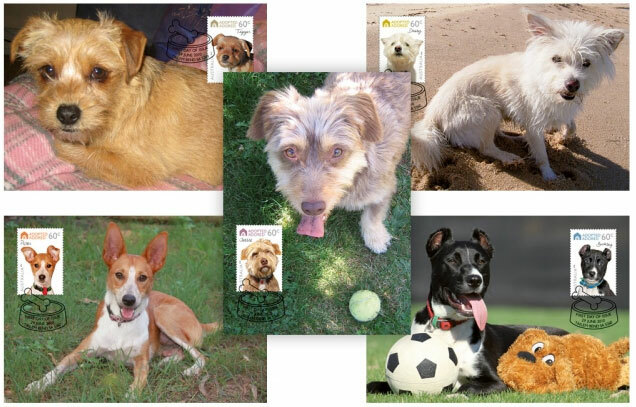 The five maximum cards feature photographs of the five dogs at play. 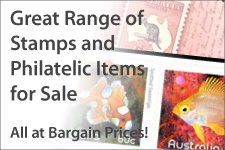 * It is cheaper for specialist collectors to buy the Collector's Pack which contains the McKellar and Pemara stamps, rather than break up an entire booklet.